Practicing — it’s something we all do — young beginners and veteran professionals, alike. Yet, it is too often viewed as tedious drudgery. Efficient, healthy practicing strategies are the key to a lifetime of joyous, injury-free performing. With pianists spending anywhere from three to as many as twenty-eight, or more, hours per week at the piano, we need to ensure that each student has cultivated a resourceful and imaginative attitude, has access to a healthy practice environment and has developed a thoughtful working agenda. This session will examine the role of the teacher in helping students liberate their practice in an effort to free their musicality. It will also address how to handle and recover from a playing-related or non playing-related injury, should it occur. What is the magic spark that serves as the impetus that encourages a student to strive for a higher level of musicianship? Although much of our focus is on teaching students a specific skill, helping them reach their musical potential, technical mastery is only a small portion of what we teach. As a result of cumulative lesson experiences, students develop attitudes and beliefs about music, learning and themselves. Teachers who are perceptive and skillful communicators are those most likely to succeed in instilling a love of music, building their students’ independence and self-confidence and helping them achieve their goals. This presentation will attempt to engage those in attendance in a lively discussion that will include topics such as motivating students, offering constructive feedback and the significance of focusing on the whole person. We will also view several fascinating film clips from the movie, “The Visitor” (2007) and discuss the various teaching styles represented in the movie. “We teach as we were taught” is an old adage that may have been true in the past, but no longer holds true in the 21st century. Pedagogical changes in the last half century in the areas of teaching approach, lesson content, technique and technology are revolutionizing piano instruction, as we knew it. This lecture will highlight some of the more recent changes and its affect on both students and teachers. Today’s teachers and students are a reflection of today’s society. Some students perceive even their weekly lessons as a frightening performance. For those students, excessive performance anxiety can stand in the way of their achieving their potential. This session will address the issue of performance anxiety, presenting a wide range of options, enabling the teacher and/or the performer to determine which combination of approaches might be most helpful. The strategies to be discussed will include: 1. Breath control and Fitness; 2. Muscle relaxation; 3. Cognitive thinking; 4. Imagery; 5. Desensitization; 6. Medical advances; and 7. Practical advise. This session will assist teachers and students in viewing performance anxiety as a positive element, not the enemy. Gail Berenson, Ohio University Professor Emerita of Piano, is a dedicated teacher, performer, author, noted expert on musician wellness issues, and the recipient of the 2002 Ohio University School of Music’s Distinguished Teaching Award and its 2016 Distinguished Service Award. A powerful advocate on musicians’ health issues, she serves as Chair of the College Music Society’s Committee on Musicians’ Health, Chair of ISME’s Musicians’ Health and Wellness Special Interest Group and the founding chair and continuing member of the National Conference on Keyboard Pedagogy’s Committee on Pianists’ Wellness. She also serves as a member of the ISME Forum on Instrumental and Vocal Teaching. 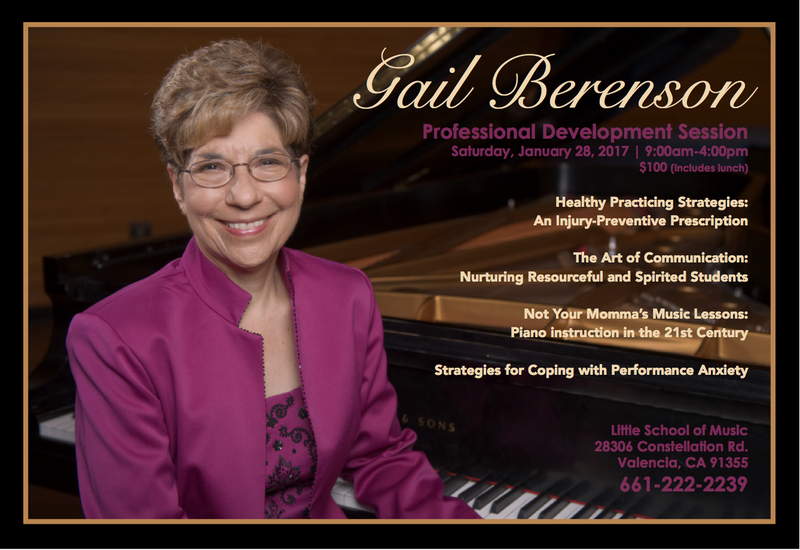 Ms. Berenson is one of the co-authors of A Symposium for Pianists and Teachers: Strategies to Develop Mind and Body for Optimal Performance and has authored three chapters for the fourth edition of the Lyke, Haydon, Rollin book, Creative Piano Teaching, published in spring 2011. She continues to be an active and passionate collaborative pianist, and has performed and lectured across the U.S. and in ten countries. Past President of Music Teachers National Association, an association of 23,000 members, she was the recipient of its 2015 MTNA Distinguished Service Award. More information can be found at www.gailberenson.com.